Dormitorium, originally uploaded by failing_angel. Figures and sets by the Quay Brothers. 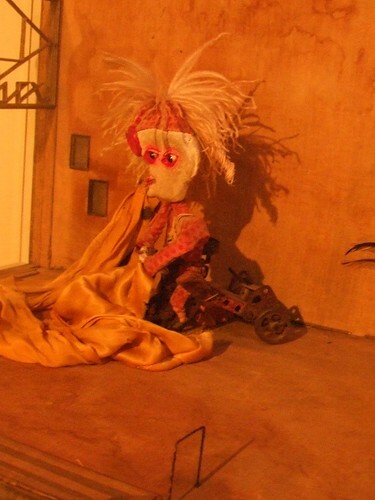 The exhibition features 10 miniature-sized film sets including puppets, props and characters which have been used in the Quay’s unique and innovative films. Stephen and Timothy Quay, identical twins, are highly influential stop motion animators renowned for their craftsmanlike methods, their attention to detail and their unusual sources of inspiration. The Quay Brothers’ films are described as surreal, moody and macabre representing a world frozen in time, full of cobwebs and dust, mirrors and strange machines. The brothers are heavily influenced by Eastern European visual and literary culture and in particular, Polish animators, Jan Lenica and Walerian Borowyczyk, as well as writers like Franz Kafka and Belgian playwright Michel de Ghelderode. The set of one of their best-known films, `Street of Crocodiles’, will be on display in the exhibition and the film will be shown in the gallery. `Street of Crocodiles’ adapted from a short story by Polish novelist, Bruno Schulz, and was selected by Terry Gilliam as one of the top 10 best animated films of all time. `This Unnameable Little Broom’ will be also shown in the Gallery and a programme of films by the Quay Brothers and Eastern European animators who influenced their work will be screened in the Leggate Theatre.